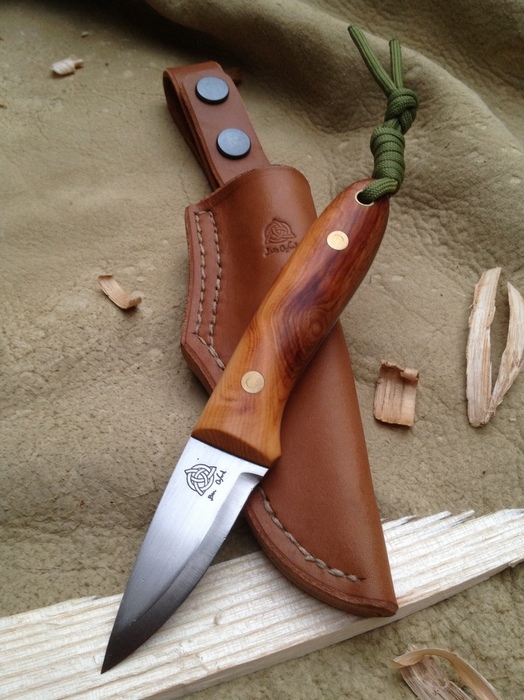 The Pixie is made with either 2mm or 3mm steel stock and has a leather sheath. One of the smallest full tang knives that we make, originally designed with a friend for his daughter to learn to carve with we have found that it is a fantastic little knife to use for woodcraft. The teardrop shaped handle can be used for universal grips and the whole knife can be held like a pencil for engraving work. The very sharp tip is really good for fine detail. Ben has a 2mm version which he carries with a 4mm Woodlander and they work really well as a team.